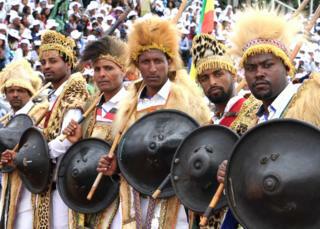 Drummers came out in force in Ethiopia to celebrate the diversity of the country’s more than 100 million people. 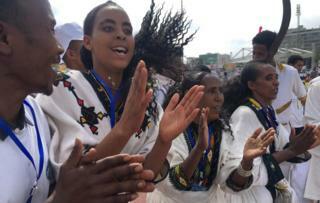 The celebration, officially called the Nations and Nationalities Day, is supposed to highlight Ethiopia’s more than 80 nationalities and ethnic groups. 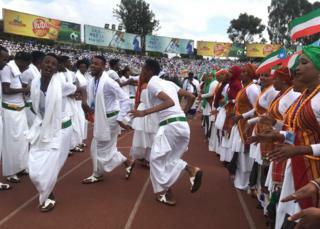 Troupes from across the country came to the main stadium in the capital, Addis Ababa, in traditional dress playing their cultural instruments. 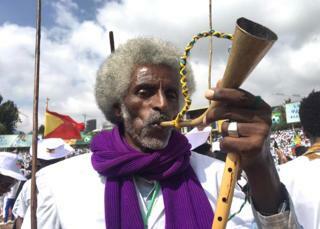 This man was part of a group from Tigray in the north, who came to the festivities with a traditional flute and horn, or “shambeko” and “trumba” as they are known in the Tigrinya language. These women, wearing clothes known as “tilfi” in Trigrinya, were clapping and dancing to the rhythm. The men from Afar came with their swords, known as “dile” in the Afarinya language, strapped to their waists and carrying sticks, or “gebahada”. Afar is a sparsely populated area in the north-east of the country. 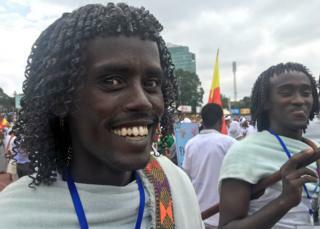 This young man, also from Afar, shows off a hairstyle which is popular in the region. Tensions between different ethnic or national groups have been on the rise in recent months, causing deaths and mass displacement. But tensions were not visible during the parade. In fact, at different times the troupes adopted dance styles from other parts of the country. 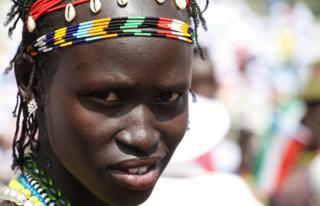 Oromos make up Ethiopia’s largest ethnic group. 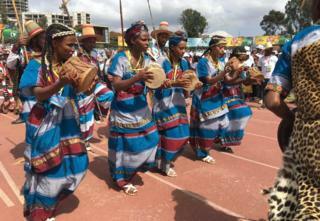 These women came from Arsi in Oromia, which is a large swathe of territory in the west and south of the country. 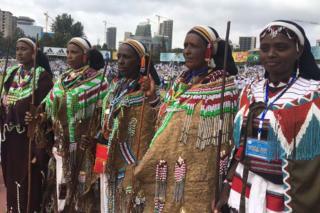 What they are wearing symbolises women’s power, including the stick, or “siinque” in the Afaan Oromo language. It is used is to call the community to offer protection, if women are being threatened. 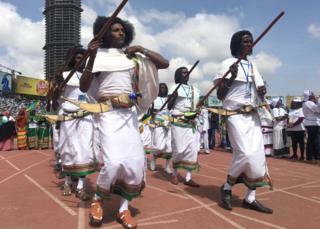 These men came from central Oromia, the area that surrounds the capital, with their shields and spears. Prime Minister Abiy Ahmed, who is from Oromia, has tried to emphasise the unity of Ethiopia since coming to power in April. There is an ongoing debate in the country about how to balance the importance of ethnicity while identifying as an Ethiopian. Healing ethnic divisions is one of Mr Abiy’s biggest challenges in the run up to elections in 2020. People also came from Gambella in the west of the country, which borders South Sudan, and this young woman is from the Nuer ethnic group. 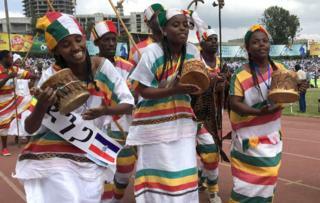 Ethiopia’s Southern Nations, Nationalities and Peoples’ Region (SNNPR) is, as the name suggests, made up of many different groups, including the Kambata, represented by these drumming women. These women came from the Somali region. The beads around their necks and waist help keep their traditional clothes, in green or orange, in place. 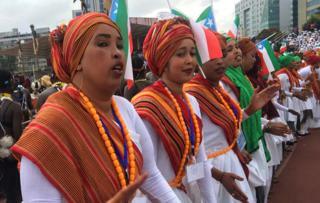 While the women sang the men from the Somali region, which is in the south-east, danced. 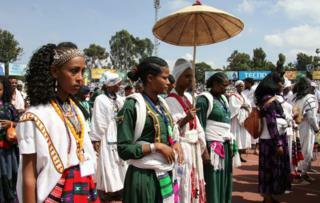 These women, from the Agew ethnic group, are from the Amhara region in the north-west of the country. There are many other ethnic groups in the region, but collectively the Amharas are the second largest grouping in the country. Words by the BBC’s Amensisa Negera and Kalkidan Yibeltal. Photos by Amensisa Negera.